A completely amazing aspect of tree plantation by connecting it to the birth of a girl child . In many parts of India, where traditionally boys have been preferred over girls, a village in Bihar state has been setting an example by planting trees to celebrate the birth of a girl child. In Dharhara village, Bhagalpur district, families plant a minimum of 10 trees whenever a girl child is born. And this practice is paying off. Nikah Kumari, 19, is all set to get married in early June. The would-be groom is a state school teacher chosen by her father, Subhas Singh. Mr Singh is a small-scale farmer with a meagre income, but he is not worried about the high expenses needed for the marriage ceremony. For, in keeping with the village tradition, he had planted 10 mango trees the day Nikah was born. The girl – and the trees – were nurtured over the years and today both are grown up. “Today that day has come for which we had planted the trees. We’ve sold off the fruits of the trees for three years in advance and got the money to pay for my daughter’s wedding,” Mr Singh told the BBC. “The trees are our fixed deposits,” he said. In Bihar, payment of dowry by the bride’s family is a common practice. The price tag of the bridegroom often depends on his caste, social status and job profile. The state is also infamous for the maximum number of dowry deaths in the country. But the mango trees have freed Nikah’s parents of undue worries. And their story is not unique in Dharhara village. With a population of a little over 7,000, the village has more than 100,000 fully grown trees, mostly of mango and lychee. 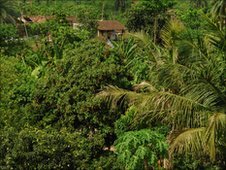 From a distance, the village looks like a forest or a dense green patch amidst the parched and arid cluster of villages in the area. One hopes that this tradition of tree plantation will spread . And that it will not be limited to the birth of a girl child alone. This entry was posted on Tuesday, July 27th, 2010 at 11:52 am	and is filed under Eco-living, Ideas we ♥. You can follow any responses to this entry through the RSS 2.0 feed. You can leave a response, or trackback from your own site. beside the fact that it is good to plant trees for a better world, i want to share that planting trees and seeing them grow is a very happy feeling for one’s own self as well . there is a nice and happy memory i have with every new tree / sapling i plant .seeing them grow and flower gives me immense happiness . There you go! now if only someone could figure out a way to harness all that monsoon water!! The doomsday pundits are crying fowl over the impending lack of fresh water while all that monsoon water washes down the drains every year….